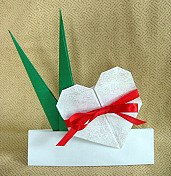 This fascinating origami heart card is as much to make as it is to receive. Source: Based on instructions by Charlene Olexiewicz in her book 50 Nifty Super More Origami Crafts. We’ve made some minor modifications and designed a larger-size version. The smaller size makes a heart about 2½ x 3 inches when closed. The larger one is 3½ x 4 inches, which gives you more writing surface inside. Both will fit in a standard No. 6¾ envelope (a small security envelope), although the larger one will be a bit of a squeeze. Both fit nicely in most card-craft envelopes. We found the ideal paper is a light-weight cardstock. When we used plain white paper, we sprayed the finished card with red glitter. Tip: To make the long, skinny folds in this model easier, use a ruler to make a preliminary crease. 1. If the paper has color or a pattern on one side, start with the paper white side up. 2. Fold the paper in half to make a “helper crease” you will use later. Unfold. 5. Unfold both of the previous folds. 6. For the small version, fold the left and right sides in 1 ¼ inches (Large: 1 ¾ inches). 8. Fold the two bottom corners up to meet the creases you made in Step 6. 9. Fold both sides in on the same creases. 10. Turn the model over. 11. Fold the top edge down on the crease you made earlier. 12. With your right index finger, hold the top layer flat. With your left index finger, squash-fold a tiny triangle. 13. Fold the corner down to meet the folded edge. 14. Fold the top edges down a tiny bit. Peek on the other side and you’ll see the heart shapes you made. 15. For the small version, make tiny pencil marks ¾ inch in from each side. (Large: 1 inch). 16. 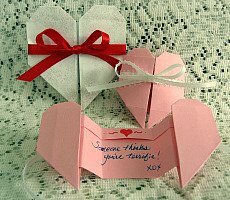 Fold the ends in on the pencil marks, but do not the fold the heart as you do this. Allow the heart halves to pop out to the side. 17. Turn the model over. 18. Fold the bottom edge up on the crease made earlier, and squash-fold a triangle. Repeat the squash fold on the other side. 19. Fold the heart halves to the back. Lay it down and crease these folds. 20. Fold the heart halves in to meet in the middle at the center crease. 21. Turn the card over and tape or glue the ribbon to the back. 22. (Optional)To prevent the heart halves from pulling away from the back when the card is opened, place a dot of paper adhesive under each half. You also might want to glue down the tiny folds at the top of the heart. 23. Write a message inside, and tie the ribbon. Tip for a nicer result: Once you get the hang of making this card, you’ll find you can skip making the center crease in Step 1. Here are some ideas for enhancing and delivering your card. Put it in a Display Stand with Iris Leaves. Stick a small Basic Heart or Heart with Tabs on the front. Set it on a Hershey’s Kiss™.